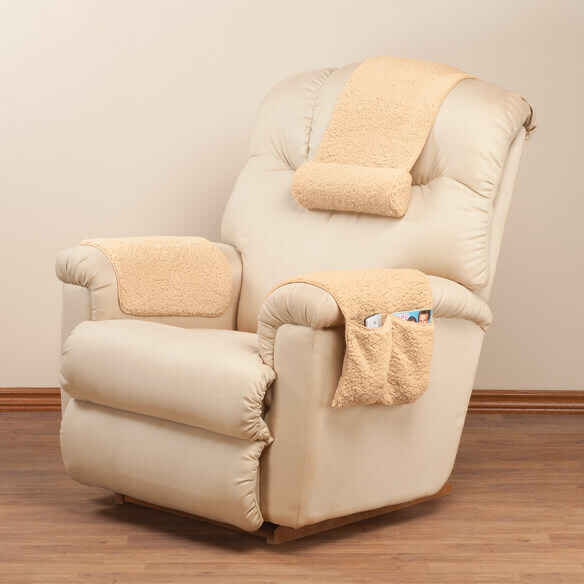 Deluxe 3-piece sherpa armrest organizer by OakRidge™ protects your favorite armchair as it stores your essentials. 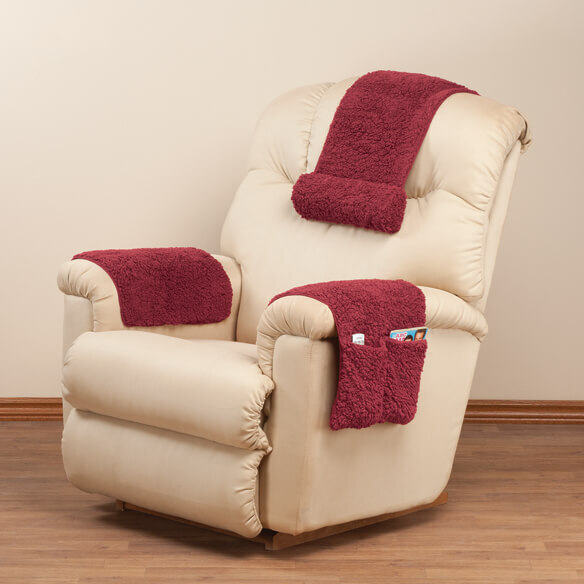 Armchair caddy (23" Lx 14 1/2"W) keeps remotes, glasses and more close at hand. Standard armrest cover (23"L x 14 1/2"W) protects against stains and wear. 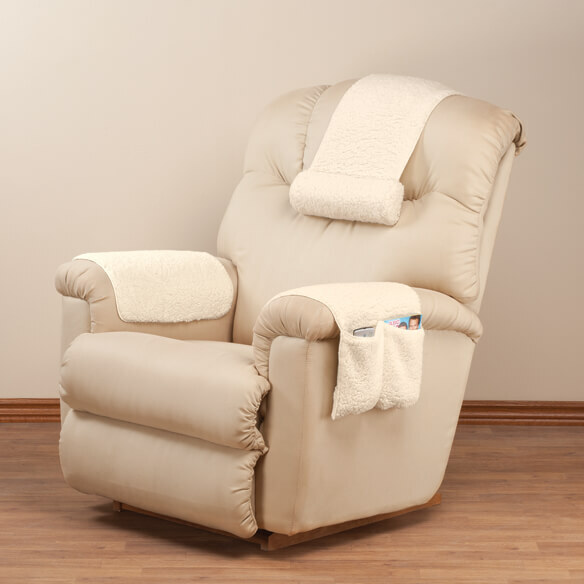 Headrest (20"L x 13"W) provides support while you relax. generously sized to fit most armchairs. I tried to use this on both a leather sofa arm and a micro fiber chair. I would not stay on either piece of furniture even without remote controls in pocket. The material is flimsy. I am very disappointed. 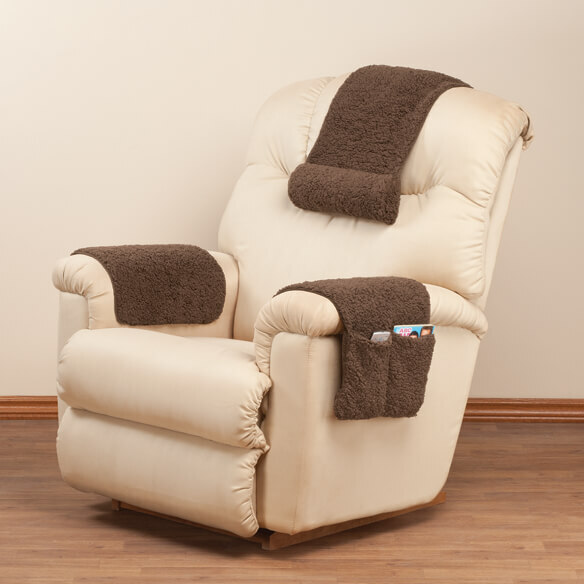 For comfort and saving new chair armrest from wear and tear. Seems right for what we need. I've been looking for something to protect just the arms and headrest. Along with the pillow, it looks like the perfect solution. My "leather" recliner has developed a bald spot that I'm hoping the headrest will cover. Needed items for a new recliner. Very handy item for people confined to chair. to protect arm rests . Can you just purchase the headrest alone? BEST ANSWER: Thank you for your question. Unfortunately we do not carry just the headrest. We hope this information will be of help to you. BEST ANSWER: Thank you for your question. Unfortunately we do carry just the headrest. We hope this information will be of help to you. how do u keep head rest in place? BEST ANSWER: Thank you for your question. We would recommend using pins to hold the top portion in place. We hope this information will be of help to you.